The Canadian River is the longest tributary of the Arkansas River in the United States. It is about 906 miles (1,458 km) long, starting in Colorado and traveling through New Mexico, the Texas Panhandle, and Oklahoma. The drainage area is about 47,700 square miles (124,000 km2). Why the river is called the Canadian is unclear. On John C. Fremont's route map of 1845, the river's name is listed as "Goo-al-pah or Canadian River" from the Comanche and Kiowa name for the river (Kiowa gúlvàu, [ɡúᵈl.pʼɔː] 'red river'). In 1929, Muriel H. Wright wrote that the Canadian River was named about 1820 by French traders who noted another group of traders from Canada (Canadiens) had camped on the river near its confluence with the Arkansas River. According to the Encyclopedia of Oklahoma History and Culture, Spanish explorers in the 17th and 18th centuries called it the Rio Buenaventura and the Magdalena. The upper part was called Rio Colorado by the Spanish. A more recent explanation comes from William Bright, who wrote that the name is "probably derived from Río Canadiano", a Spanish spelling of the Caddo word káyántinu, which was the Caddos' name for the nearby Red River. 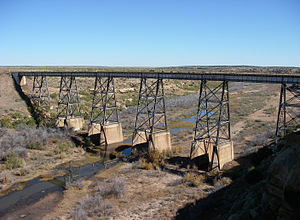 The name could be of Spanish origin from the word cañada (meaning "glen"), as the Canadian River formed a steep canyon in northern New Mexico and a somewhat broad canyon in Texas. A few historical records document this explanation. Edward Hale, writing in 1929, considered the French origin of the name most probable. The first European to explore the Canadian River was Juan de Oñate, the Spanish Governor of New Mexico, who followed the river from its origin to the western plains of what is now Oklahoma in 1601. Spanish traders and hunters were soon actively working in this area. French voyageurs were active along the lower Canadian. Bénard de la Harpe explored between the mouth of the river and the Kiamichi Mountains in 1715. Pierre and Paul Mallet followed the entire length of the river in 1740, as did another expedition led by Fabry de La Bruyere in 1741. [a] The Louisiana Purchase in 1803 resulted in all of the land east of the New Mexico border being acquired by the United States. In 1818, the Quapaw tribe ceded all its land north of the Canadian to the United States, thus making this river the effective southern boundary of the new nation. In 1825, the Osage ceded their claims to land along the river. The Canadian was designated as the boundary between the Creek-Seminole lands on the north side and the Choctaw (and later the Chickasaw) on the south side. Major Stephen H. Long led an expedition up the Canadian River in 1821. He proclaimed the land along the river as the "Great American Desert." Despite this assessment, trading posts were established along the river, starting with Edwards' Post at the mouth of Little River. Camp Holmes was established by Colonel Henry Dodge's Dragoons in 1834. Captain Nathan Boone led a dragoon troop up the river to the 100th Meridian, which was then the western border of the United States. The Treaty of Doak's Stand in 1820, made the Canadian River the northern boundary of the Choctaw Nation. Early immigrants to California followed the south bank of the Canadian to Santa Fe. In 1845 the river was explored by Lieutenants James William Abert and William G. Peck of the U.S. Army Corps of Topographical Engineers. Their journey was chronicled in the Journal of Lieutenant J.W. Abert from Bent's Fort to St. Louis, first published in 1846. Randolph B. Marcy commanded a military expedition to lay out a trail along the Canadian River in 1849. The trail, which was thereafter called the California Road, followed the south side of the river and was soon followed by large numbers of emigrants to California via Santa Fe, especially after the 1849 discovery of gold in California. Travel along the road was sharply curtailed during the American Civil War, as Union and Confederate forces fought for control of Indian Territory. Lieutenant Amiel Weeks Whipple led an expedition in 1853 to find a railroad route across Indian Territory. It covered some of the same ground as that explored by Abert and Marcy. Whipple's group provided extensive reports about the region's flora and fauna. However, its cost estimates discouraged proponents of building a railroad along the proposed route. However, the cumulative reports of Abert, Marcy, and Whipple changed public opinion about "The Great American Desert" and encouraged interest in developing the region. In 1890, when Oklahoma Territory was proclaimed, the river formed part of the boundary between Oklahoma Territory and Indian Territory. This boundary was eradicated when the State of Oklahoma was created in 1907. The river rises on the east side of the Sangre de Cristo Mountains, around 9,600 ft (2,900 m) above sea level, in remote southwestern Las Animas County, Colorado, roughly 1.5 mi (2.4 km) north of the New Mexico border. [b] An upper tributary of the Vermejo River heads around 12,000 feet in elevation in the Culebra Range and has a confluence with the Canadian south of Maxwell, New Mexico. Overall, the meandering course is 906 miles (1,458 km) from its origin to its confluence with the Arkansas River. The main tributaries are the North Canadian, Little, and Deep Fork Rivers. After rising in Colorado, the Canadian flows east-southeast across the New Mexico border, then south, passing west of Raton, New Mexico. It forms a deep canyon south of Springer, New Mexico. The Sabinoso Wilderness area is located in side canyons near the river. At its first dam at Conchas Lake, the river turns eastward. It is also dammed at Logan, New Mexico, where it forms Ute Lake. From there it crosses the Texas Panhandle, dammed at Sanford, Texas, where it forms Lake Meredith. The canyon the river carves through eastern New Mexico and the Texas Panhandle is the northern border of the Llano Estacado, separating it from the rest of the Great Plains. From Texas, the Canadian continues eastward into Oklahoma, passing just south of Oklahoma City. At Eufaula, Oklahoma, it flows into Eufaula Lake, the largest on this river. About 20 miles (32 km) downstream, it joins the Arkansas River at Robert S. Kerr Reservoir, around 40 miles (64 km) west of the Arkansas border. For most of its length, the Canadian is a slow-moving waterway bounded by red mud flats and quicksand. When sufficient rain has fallen, the river can carry substantial amounts of water. The river is now under the control of the Canadian River Commission. ^ Fabry de La Bruyere was a French government official of New Orleans who led the second expedition up the Canadian River. ^ The Encyclopedia of Oklahoma History and Culture gives the coordinates of the river's origin as approximately 37˚01´ N, 105˚03´ W.
^ a b c d e f g h i j Dianna Everett, "Canadian River." Encyclopedia of Oklahoma History and Culture. Retrieved October 7, 2013. ^ Wright, Muriel H. "Some Geographic Names of French Origin in Oklahoma", Chronicles of Oklahoma, 7(2):188-193, June 1929. ^ Bright, William (2004). Native American placenames of the United States. University of Oklahoma Press. p. 78. ISBN 978-0-8061-3598-4. Retrieved 8 March 2011. ^ Hale, Edward E. "French Place-Names in New Mexico", French Review, 3(2):110-112, November 1929. ^ U.S. Corps of Topographical Engineers. "James William Abert 1820 - 1897". Archived 2015-08-01 at the Wayback Machine Accessed March 8, 2015. ^ Vernon L. Volpe, "Whipple Expedition." Encyclopedia of Oklahoma History and Culture." Accessed March 8, 2015. Wikimedia Commons has media related to Canadian River. Sketch of the Canadian River in A pictorial history of Texas by Thrall, H.S., Portal to Texas History, University of Texas. "Canadian River" . New International Encyclopedia. 1905. "Canadian River" . The American Cyclopædia. 1879. This page was last edited on 28 January 2019, at 17:39 (UTC).